California — Our California model features a modern split-level design that lets in additional sunlight. Cathedral — Our cathedral sunrooms are characterized by their elegant vaulted ceilings. Conservatory/Solarium — Our conservatory and solarium models both feature polycarbonate roofs that are ideal for stargazing. Santa Fe — Our Santa Fe sunrooms offer a hint of Mediterranean flair with their stylish pergola trim. Studio — Our studio model (available in one-, two-, three-, and return-wall configurations) is incredibly versatile. 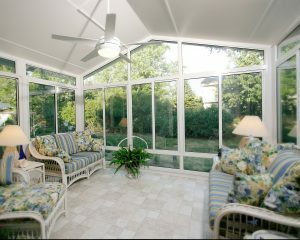 We also carry sunrooms from the Nino Vitalo Signature Collection, named for our manufacturer’s founder. If you want to ensure that your new addition matches the rest of your Springfield, PA, home, this is the perfect option for you. Sunrooms from this collection are available with choices such as matching brickwork/siding/roofing and optional knee walls, allowing for full architectural integration. In addition to choosing the style of your new sunroom, you’ll have the opportunity to select from a number of customizable features. You can choose the color of your new sunroom (white, sandstone, or bronze), the glass type (single- or double-pane), and the window system (prime window or window wall). You can also choose to upgrade the window panes from an SPF of 59 to an SPF of 85 for additional UV protection. For more information about the sunrooms we offer to homeowners in the Springfield, PA, area, please contact SRA Home Products today.